Did you know color digital personalization on envelopes emerged at the same time color digital presses really started to gain widespread adoption in the industry? But that was about 10 years ago—so why are you just hearing about envelopes now? I want to cover some of the reasons this technology has taken a backseat to the larger format presses and why it is worth looking at now. Early models of color digital printers for envelopes have been available for a number of years; in fact, eight years ago, we tested one. However, at that time the need for combining form versions and enhancing the personalization capabilities on letters outweighed the demand for personalized envelopes. Investing in color digital forms presses was a logical first step in the evolution of color digital printing. That has proven the value of color digital personalization. Now that that technology is maturing and has a significant number of marketing programs utilizing it, we are ready to look at adding color digital personalization for the other components in a direct mail package. For many of the reasons noted above, the technology for printing on the envelopes has not evolved as fast as the larger digital forms presses. There has been some enhancement of the hardware and inks, but most of the evolution to this point has been related to the digital workflow and processing of print files; in other words, the print file types and the RIP (raster image processor) for those familiar with the technology. Color digital personalization on envelopes can have a huge impact on your campaign. This technology allows us to expand the area of personalization and align the 1-to-1 messaging on the envelope to match the digital letters inside. It opens up options to coordinate the messaging in a window with attention-grabbing personalized messaging on the envelope. Like all ‘new’ technologies, there is a learning curve to efficiently producing personalized envelopes. The amount of education required really depends on the starting point. We have some clients moving to color digital envelopes who already use monochromic (single color) personalization on their envelopes and some who don’t personalize their envelopes at all. Either way, there are differences in requirements and capabilities that we educate our clients on to transition smoothly to the new technology. One of the items we highlight when adding color digital personalization to the envelope, or letters for that matter, is ink coverage. You don’t want to lose your messaging in a sea of ink, not to mention that digital inks can be expensive. We also highlight building your art within the print head height along with appropriate barcode and verification codes to support the most efficient production. One of the unique challenges presented with personalizing envelopes is that they already have the contents inserted. This results in things like variations in thicknesses and flatness, which can cause some print distortion if it is not planned properly. As a rule, try not to print right to the edge of your envelope or window. Currently the R&D team is testing treated paper stocks versus the standard non-treated paper typically used when producing envelopes. We have also tested a variety of different art and print file types. We have found these to be critical areas to focus and test to optimize our print quality, both in resolution and color. Color digital printing has opened up the option to merge ‘versions’ along with adding the capability for personalized messaging to each individual recipient. 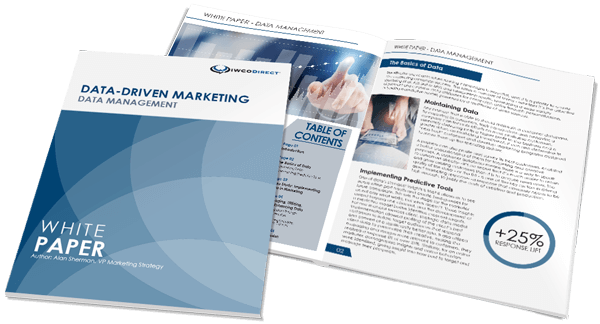 As more components in the total direct mail package move to color digital technologies, the marketing campaigns they’re used in will be more relevant. Not only does this allow for better production and postage savings by merging jobs into a single stream, it also delivers the most effective and personalized messaging possible. Don’t take my word for it—read the upcoming blog from my colleague, Executive Creative Director Mike Dietz, on how to create an effective color digital envelope.